Crescent Design and Construction offer homeowners in the Northern Virginia and surrounding areas an easy solution to your old, outdated, cracked, and damaged flooring. Concrete! We know that as soon as you read that, you probably wanted to exit the page, but hear us out! 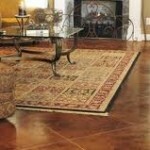 Concrete resurfacing is no longer an ugly, boring slab of cold floor. Now available to homeowners everywhere is newly updated concrete materials, offering extravagant solutions to expensive tastes. An untreated concrete floor often has dusty, chips, pits, flakes and stains easily, and is a dull gray color that doesn’t reflect much light. 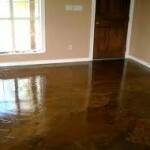 For years, people have tried to solve these problems with solutions ranging from cheap (a coat of paint which will start peeling up within a year) to fairly expensive (good 4- coat epoxy floors that stop dusting, reduce staining, and brighten the room). The commercial flooring industry was the first to discover that although the initial process of polishing concrete floors is more expensive than coatings like linoleum, over the life of the floor it becomes the cheapest since there is basically no maintenance, it’s easy to clean, doesn’t wear out from foot or vehicular traffic, and brightens a room by 35% (as opposed to 8% for a good epoxy floor). It doesn’t matter if it is indoor, outdoor, a wall, a walkway, a driveway, for your home or for your business, we can transform your space in to something exciting! Your concrete surface gets a makeover using concrete stamping, concrete stenciling, acid staining, or decorative etching to create an entirely different surface! Your once concrete flooring now looks like marble, stone, granite, travertine, bricks, interlocking pavers or even wood planks. Concrete is now one of the most versatile materials on the market. It already has the reputation of incredible durability and strength but now gets a nod for its design capabilities! 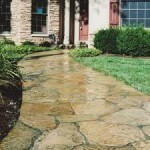 Call us today to repair, renew, and surprise yourself with the magic that stamping concrete can make! We currently serve and work within Arlington County, Fairfax County, Oakton County, McLean, Clifton, Fairfax Station, Great Falls, Oak Hill, Ashburn, Falls Church, Alexandria, and Burke Virginia. And that’s just to name a few! We are conveniently located so that we are also able to serve Maryland and Washington D.C. as well. The core values of Crescent Design and Construction guide our behavior and our business. The test of our company’s values is not what we promise but rather by what we deliver and how we deliver it. Put your trust in an experienced, recognized, and family owned masonry company. Call us at (703) 665-3545 to schedule your in home consultation today! We have specialized in room additions, home renovation, home automation, roofing, stone patios and general contracting in Northern VA & Fairfax for 20+ years.